L-Cave dive site is located off Qawra Point on the north coast of Malta. L-Cave is quite tight cave with a sandy bottom in a depth around 30 to 35 metres. The cave is a swim-through tunnel with an L-shaped bend, hence the name. Kicking up sand at the narrow entrance can drastically reduce the visibility inside the cave. 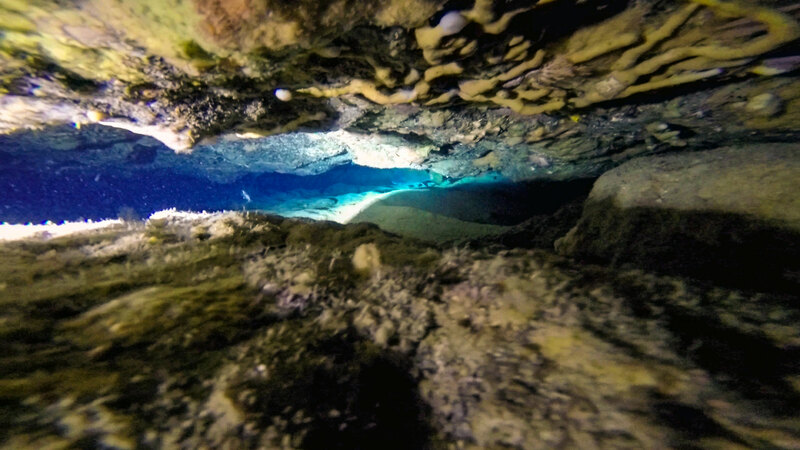 This cave dive is suitable for experienced divers only. 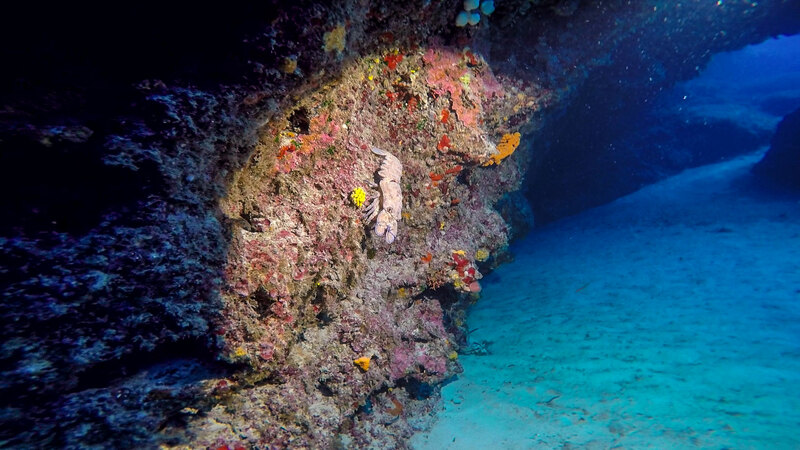 L-Cave is best done as a boat dive, but can be dived from the shore. It takes about 15 to 20 minutes to reach L-Cave from Qawra Point pool and is quite easy to navigate: Just follow a compass bearing of 30° until you face Qawra Reef drop-off from 15-20 m down to 30-35 m, then keep following the wall to easterly direction and in few minutes you end up in a valley. L-Cave entrance is located at the bottom of the wall across the valley at 33 m, partially hidden behind a rock. The first 10 metres of the cave are narrow and dark, but after that the tunnel widens and turns to the left (the L-shape) showing up the light of the exit, which is at 36 m depth. 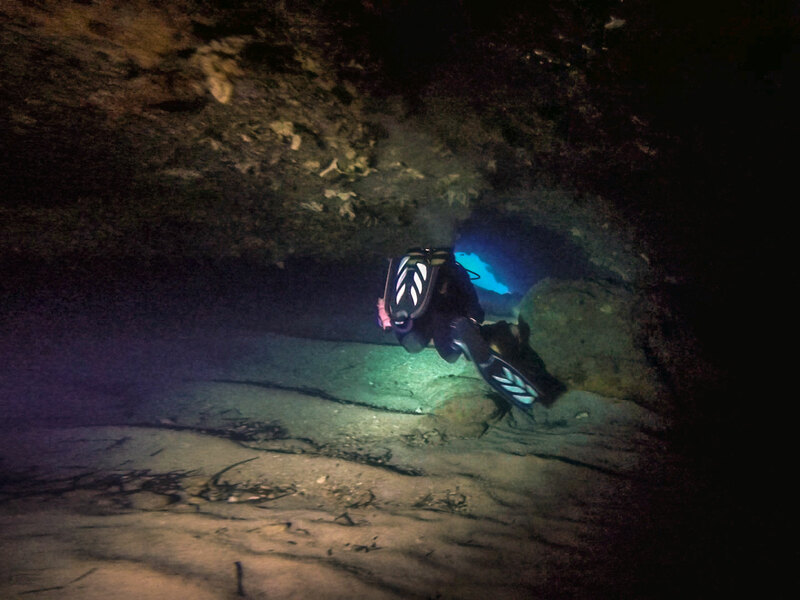 If diving L-Cave from the shore, watch out for boat traffic and carry a DSMB. ★★★☆☆ Quite a long away from the shore and quite a tight entry to the cave, but overall very nice visit.